Calvary Lutheran School is accredited by the Missouri Nonpublic School Accrediting Association and the National Lutheran School Accreditation Agency (NLSA). 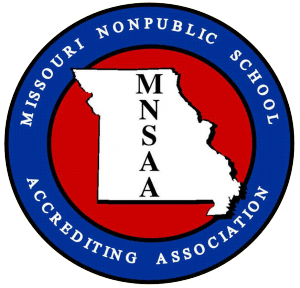 The Missouri Nonpublic School Accrediting Association is affiliated with the National Federation of Nonpublic School State Accrediting Associations, which is recognized by the United States Office of Education and CASE (Council for the Advancement and Support of Education). Accreditation from the NLSA is a process of self-evaluation and objective observation designed to help Lutheran schools improve the quality of their programs. The process is completely voluntary and available for every school operated by a single congregation, by an association of congregations, or by a Recognized Service Organization of the Lutheran Church – Missouri Synod or the Lutheran Church – Canada. NLSA accreditation is a rigorous national process designed to evaluate schools based on their unique purpose as Lutheran learning institutions. The accreditation process helps schools evaluate not only the quality of the academics and programs, but also most importantly the spiritual dimension of the school. The “Standards for Lutheran Schools” and report forms are similar to those used by other accrediting agencies, both secular and religious. The National Accreditation Commission, which is made up of representatives from various participating districts of the Lutheran Church – Missouri Synod and the Lutheran Church – Canada, governs NLSA. The process is owned and operated by the District and Congregation Services of the Lutheran Church – Missouri Synod and is a service of the LCMS School Ministry. Over 500 Early Childhood Centers, Elementaries, and High Schools are currently accredited by NLSA.